Are you a novice cook? This recipe is a very basic chili recipe for you. This recipe is part of my learn to cook series, where I am cooking through my old home economics cookbook. Making chili may seem mysterious. It isn’t, a good chili recipe is to be had. You can make a flavorful chili from scratch. You don’t need to buy special packets of seasoning, you just need a few simple ingredients for making chili. If you are new to my Learn to cook series, this is where I am cooking through my old home economics cookbook from junior high school. So I was making this years ago when I was learning how to cook this is one of my guides that I used. Chili ingredients are very basic, and you can always change your chili to your personal preferences. You will need a few basic ingredients. Ground beef is one of the most important ingredients for chili, I personally like to use ground chuck, I think it has better flavor than most other types of ground beef. Onions are popular in chili. When it comes to onions I have a small preference for white onions over yellow. I think white onions are a little sweeter. Honestly, I just look at what is less expensive. You will also need canned tomatoes, and chili powder. I think the biggest question people have is to add beans or not? While if you are living in Texas, you may feel that chili does not contain beans. It is up to you if you want to add the beans. I like to add either red kidney beans, pinto beans, or even Ranch Style Beans. You may also want to add other spices, the spices that I like to use are cumin, chipotle powder, cayenne pepper, or sometimes I like to add even some extra chili. Keep in mind you can add a lot of different items in your chili. Be sure to practice adding one thing at a time in small amounts. This way you can feel confident that the variations you choose to make if you make small changes at a time. 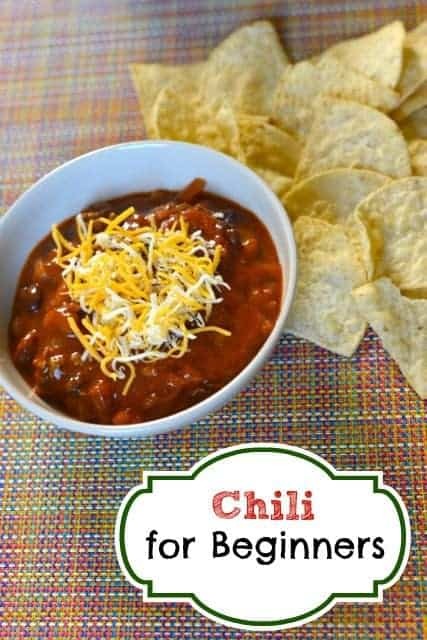 Even if you have never cooked you can make a tasty bowl of chili. Brown the ground beef and chopped onions in a medium sized skillet over medium heat. Season ground beef with salt and black pepper as it is browning. Drain beef when browned.In a medium sized pot add tomatoes, beans, juice, and chili powder. Add cooked ground beef and stir to combine. Simmer for approximately 1 hour before serving. Just wondering if u don’t use tomatoes can u use a can of tomato paste instead to substitute dieced tomatoes? Thanks for doing this! I am going to make this for my husband tonight. Just FYI, those of us that are truly novice (myself) don’t know exactly what “simmer” means or if that means to simmer with the lid on or off. *Or, if you stir periodically during simmering. Simmer to me, means that you turn the heat on very low, and stir it once in awhile. You can leave the lid on or off. It doesn’t matter. When I say stir it once in awhile, I mean I want you to stir the chili about 15 minutes or so. Hi Stephanie, I live in a small town in Spain and haven’t been able to find chili powder. What are it’s basic ingredients? The basic ingredients are listed in the recipe. I really think that chili powder is critical in this recipe. Every great chili recipe I have ever tasted either dinning out or made at home has chili powder, except one. Skyline (Cincinnati Chili) has no chili powder but it does include one square of semi-sweet chocolate. It is our # 2 go to recipe at home. Buy chili powder on line…. I want to try this sometime. I also want to try making enchilada sauce like this as well. What do you like in your chili? I like anything you put in chili as long as it’s not spicy….